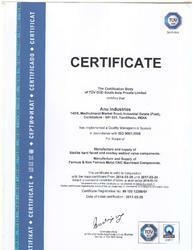 Founded in the year of 1987, we Anu Industries, an ISO 9001:2008 certified company stored in the database of the most trusted and prominent manufacturer, supplier and exporter of the optimum quality Precision Components and Accessory. In our wide range of these products we have assorted Valve Trims, Valve Disc and Stellited Components. Offered products are designed and manufactured by taking finest grade basic material and components in accordance with the set industry parameters. Offered products are highly appreciated among our clients for their exact performance, fine finish and trouble free functioning. To suit the varied demands and needs of our clients in efficient manner, we are offering these products in wide variety of technical specifications. Apart from this, customers can avail these products at leading market from us. Along with this, we are also offering welding service to our valued customers. We are providing best quality products to our clients in bulk quantity also. For this purpose, we have constructed a highly advanced and well equipped infrastructure unit. We have installed upgraded machines and tools at our facility desired for the fabrication process of our offered products. To handle the development process of our offerings we have recruited a team of skilled and knowledgeable professionals. We have selected them after assessing their knowledge, working experience and educational ability. Apart from this, our professionals are working with full coordination with clients and each other also and ensure optimum level of customer satisfaction. We assure safe and timely delivery of the offered products. We export our products in France and Spain. Owing to the valuable supervision of our mentor Mr. G. Manikanda Prabu, we attained such a distinct position in the relevant industry. Because of his rich knowledge and client centric approach, we have established a wide client base across the nation. We attribute the exponential growth of our company to the unwavering efforts of our competent professionals. Our organization is empowered by a team of experienced professionals. With the support of these professionals, we have been able to develop improved items that are sought after in the market. The expertise of our professionals in their respective domain help them in ensuring that the offered products are designed accurately and work effectively with low maintenance. We get appreciation consistently from our clients due to our superior quality products, and their market leading prices. Also, our clients centric policies and strategies make us first choice of the clients. Our company has developed well organized infrastructure, thus we meet the diverse requirements of the clients on time without compromises made on quality. 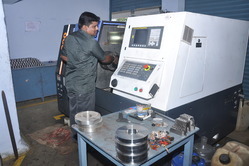 It is facilitated with various machines tools and equipment which help us to manufacture superior quality products in bulk as per the exact demands of the clients. Also, we upgrade it time to time according to the current scenario and trend of the market. Our manufacturing unit is well equipped with useful tools and machines for the fabrication process of our offered products. Our manufacturing team members work with complete competence and allow us to meet the various demands of clients. We have development these products perfectly and tested before supplying it to the customers. 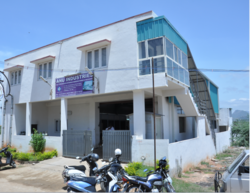 Our ultramodern facility is the prime reason behind the achieved top position in the market. We are among the topmost manufacturer, supplier and exporter of the best quality precision components & accessory. We are offering our products in various technical specifications to suit the varied demands of our valued clients in best possible manner.